Sculpture by the Sea, Cottesloe is delighted to announce that Lotterywest has come on board for a three year partnership agreement to fund our Access & Inclusion Program. The program offers visitors of all ages with a wide range of disability and their carers free of charge initiatives at Sculpture by the Sea, Cottesloe. Beach Access Program, Sculpture by the Sea, Cottesloe 2017. Photo Stellar Fraser. Our Access program was introduced at Sculpture by the Sea, Cottesloe in 2009 in partnerships with Art Gallery Western Australia (AGWA) Access Guides. The program offered ‘Touch Tours’ to 12 participants and 5 carers who were blind and/or vision impaired. Renamed ‘Tactile Tours’ in 2010 they have continued to provide a unique opportunity for adults and children with disabilities to experience sculpture ‘hands-on’ through touch and informed dialogue with experienced guides, educators and the artists themselves. We have worked in partnership with DADAA (Disability in the Arts, Disadvantage in the Arts) and AGWA throughout this time to develop new programs and involve new audiences. Last year 820 visitors participated in Access & Inclusion programs during the exhibition. This year we will continue to provide the ever popular Tactile Tours with DADAA guides, weekdays (and one weekend) during the exhibition period. Due to the success of the Beach Access Days introduced in 2016 they will take place again this year on Wednesday 14 and Thursday 15 March. 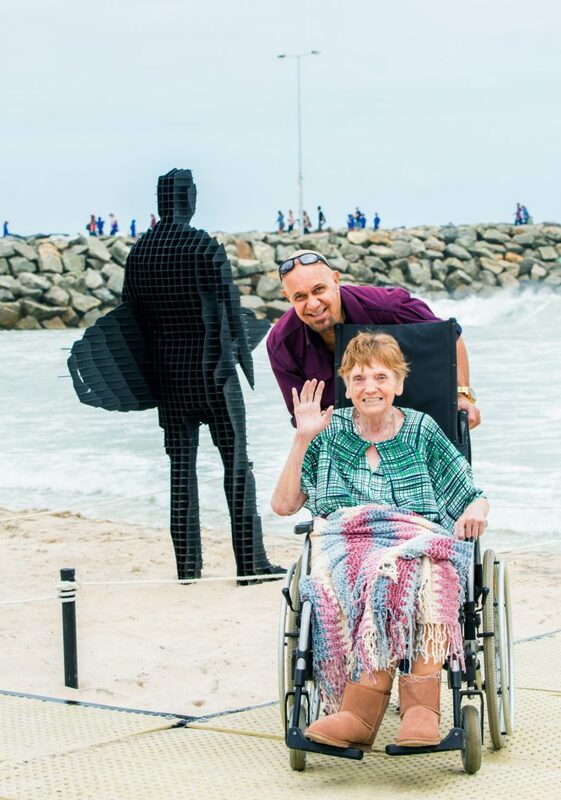 Special matting will be installed in some areas of the beach to allow people with limited mobility or using wheelchairs access to the sculpture on exhibition. The event will be staffed with Sculpture by the Sea trained assistants from 10am-7pm on both days and additional first aid will be provided. Our public program of Artist Talks at weekends invites visitors to meet exhibiting artists on site and hear their stories and perspectives about their work. These will be Auslan interpreted on Saturday 3, Saturday 10 and Sunday 18 March 10.00am-12.30pm. The closing ceremony and Peoples’ Choice announcement will also be Auslan interpreted on Sunday 18 March at 2.00-2.45pm. Specialist tours will include disadvantaged community groups, senior residents at Amana Living and a pilot program involving people with dementia. The Lotterywest funding will also allow for the provision of wheelchair accessible ramps at Cottesloe Beach, a large print exhibition catalogue for visitors with low vision to borrow from the Exhibition Catalogue marquees, and a temporary accessible toilet. A wide ramp entrance to Sculpture Inside, our free indoor exhibition of small sculpture will provide access for visitors with limited mobility or using a wheelchair. The exhibition is located on the corner of Forrest Street and Marine Parade. We look forward to welcoming visitors with disability to this year’s exhibition. Contact [email protected] or (02) 8399 0233.